A very Happy Friday to all! We do have an optional twist for you-use this sketch if you want. There blogs are full of inspiring projects. Take a few minutes to browse around their blogs and then take a look here to see what they and the rest of the DT have created for us. We are joined for this challenge by a newest design team member Sarah. If you missed yesterday's welcome post then take a look and then visit her creative and inspiring cards on her blog Funky Fossil Designs. 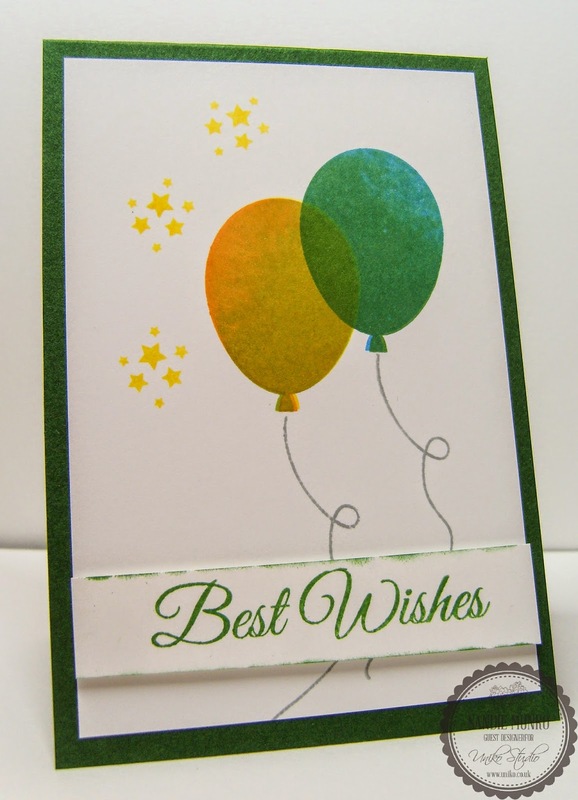 Gorgeous Sandie, love your two tone colours to the balloons. Makes them 'pop' ... well not literally (you know what I mean)! Oh, I love your card! The balloons look spectacular! Love the 2 tone technique. Beautiful card! Those balloons... WOW! Beautifully done, Sandie. Oh I am going to have to have a look at the two tone stamping. It looks absolutely stunning Sandie! Love your balloons. They are beautiful. A card with plenty of party feel! Those balloons came out great, I like that you can see some of the one in the back through the one in the front, it gives a great translucent feel. Sweet card...love those fabulous balloons, a fabulous party on a card. So festive. Gorgeous card, Sandie! Love your ballons, look amazing! Oh I do like the colours you've used and the way you've stamped the balloons to give so much depth. Perfectly CAS, just fab! Wishing you a slice of happy!